Kittens Gone Lentil: VeganMoFo 2015 #29: Road trip snack attack. ohhhhh Gizmo looks hilarious! Ha ha that's made my morning/lunch! You got a good road trip selection there for sure. That is one good snack stash! I am well impressed. I think you've got the road trip thing nailed. Sounds like you'd be a great road trip buddy! Gizmo looks like ahhh get me out of here! I bring snacks for all! Great choices for a vegan road trip! "This pile is a little leftover VVC swag bag,"
Loving your snack choices. I forget about Cliff bars, I used to really enjoy those. It's funny how you go through phases of forgetting things sometimes and then remember and get excited. 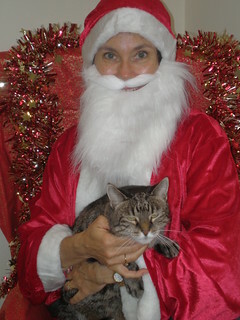 Very cute picture of Gizmo and Santa! 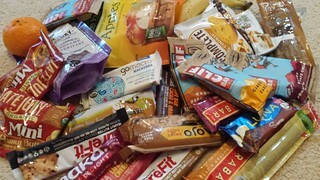 I am a hoarder, so there are a still a couple of PureFit bars left. Though I recently saw some of them in in Sydney, so maybe I can get them in Brisbane now. Those Late July "sandwiches" are so amazing and addictive. ConFlu is real! Someone just called in Cosplague, which is clever. ha ha. I am also a total panic-buyer when it comes to hunger prevention. I have a special crate in my cupboards just for all the bars I am constantly buying (and eating). I love trying new ones, and plus i love stocking up on my usual favorites.